i'm so glad you all enjoyed my hot picnic feast at the allotment! the ginger parkin is getting even tastier as the days go on, but there are only two squares left, and i shall be very sad once it's all gone...though by that point it'll be the weekend, and i'll have fireworks galore and plenty of hot roast chestnuts to cushion the blow. 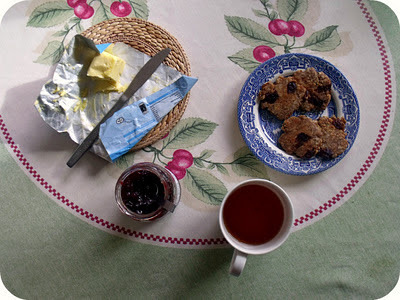 today i want to share a simple and quick recipe with you - i love these with a little melted butter, honey, homemade jam or coconut oil for breakfast or as a quick late night snack with a cup of tea. 1. combine all the dry ingredients together in a bowl. 2. mix in the honey, and then add in warm water a drizzle at a time, until the mixture comes together to form a slightly sticky dough. 3. leave for 30 minutes, or overnight, or store in the fridge for use throughout the week. add a little more water if the dough seems dry - the oats will soak up a lot of moisture. 4. shape into flat patties, and cook in a hot dry frying pan, until golden on each side. you can roll out the dough, and cut shapes out with a cookie cutter if you like, but i love the rustic look and speed that hand formed patties give! this is a time honored recipe, that you can make and keep in your fridge throughout the week until you fancy it. bannock is a fabulous name for what is essentially just a flatbread, that is cooked on a dry griddle or campfire. bannocks are perfect when you're cupboards are a little bare, as they only really need three ingredients (wholegrain flour, baking powder and water). though i've jazzed them up a little here, you can interchange different grain flours (buckwheat, quinoa, gluten free, wholewheat, rye, teff) and add different flavourings too - you could add other dried chopped fruit, spices or make savoury herbs ones. now onto the business of money saving... courtesy of Laura's big budget challenge! well the week's are flying past and i can't believe it's already a month into the challenge, how crazy is that?! we've spent lots of time up at the allotment preparing the ground for the winter and next season, by laying weed prevention sheeting and bark chips down to make it more manageable. there's also a vast quantity of manure to spread over the beds to enrich the soil and make our food even more nutrient rich! i still haven't bought any clothes! i am so happy now eating simpler foods, and vegan foods. instead of needing lots of fruit and veg, i am loving wholegrains and pulses, and meals with a few bland coloured veggies. the whole 'anti-oxidant' thing meant that i felt like eating more colorful veggies would bring me better nutrition - but who's to say that's the case? making food with lots of spices and herbs is one of the best ways to keep simple foods varied, exciting and delicious! i pick up big packets of spice for 60p from the local market (which would fill up a regular spice jar twice - not bad), and there's so many interesting one's i've never cooked with, that i can't wait to pick up to experiment with. so far i've picked up the essential refills that i need, like cumin, paprika and cinnamon. last week i got some ground ginger, ready for my oatmeal ginger parkin for bonfire night - yum! buying fresh ginger and storing it in the freezer has worked really well. it only cost 60p for a large portion from the market stall, and after freezing it, it's actually easier to use - easier to scrape off the skin and much better to grate finely. there's still so much for me to learn, and it's a continual process, but i am loving it! currently reading: vogue - i have a few issues on the side to catch up with, but i love the photo shoots in the december issue. absolutely gorgeous, set in mongolia. I think I must have accidentally missed your bonfire picnic so just caught up with it, it looks fantastic! I'm having a bonfire night get together and I'm so excited! You continue to do so well on the budget challenge, your really inspiring me, I'm even going to put my name down for an allotment! 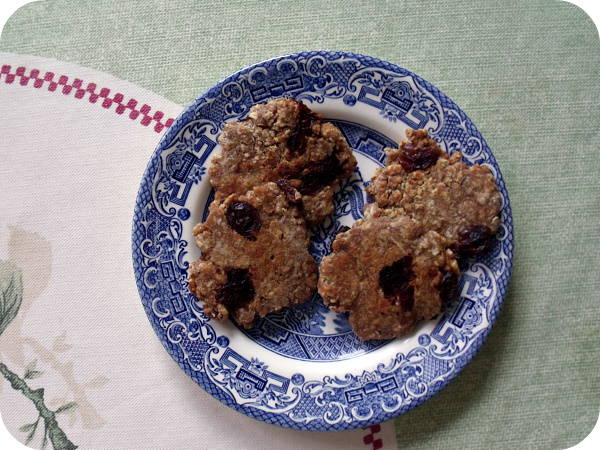 These raisin bannocks look lovely and just shout autumn to me! Great tip on keeping ginger in the freezer. I always have fresh ginger in the fridge but often find that towards the end it is looking a bit sad. Brilliant post. Have a good Sunday. Great foraging of the wild apples! :) There's so many things you could do with them. I love apples stewed with cinnamon. So simple but so delish! I'm planning to cook a huge pan later today and freeze them in portions for the coming months.